Now that the driveways are cleared and the roof is shoveled [EEK! ], I can get back to some monster-making! I finished a bunch of oddball monsters today. They will be looking for homes. I'm still bummed about missing the RMSC show this weekend, but there are a few other shows that I'll be at before Christmas. 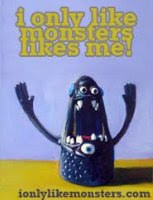 There will be lots of new monster friends waiting for you there! You can always email me your order too. Here's one for the record books! Since Tuesday [which was only 4 days ago] we got somewhere between 70 and 80 inches of snow. That's like 6 FEET. OF SNOW. NO LIE. Monday night it started snowing. It was just one of those normal, flaky, snow globe type snows except for one scary addition: thunder and lightning. For future reference, if there is snow AND a thunderstorm, it's about to go down! Tuesday morning I woke up to more than a foot. I documented the snow accumulation throughout the day... it just didn't stop! All day. It kept snowing into Tuesday night and by the time I woke up Wednesday morning, we had somewhere around 3 feet of snow. THREE FEET! In one day! Impossible! We spent the whole morning cleaning up and digging out. It took 4 adults with a snowblower and shovels to get it cleared. Many hard working hours later I had a driveway! Hooray! Not that it did any good... the road wasn't really plowed and there were driving bans everywhere. The forecast predicted that there was more snow on the way, but it couldn't be that bad. Right? Thursday was another all day snow and another 3 feet. It kept coming all day, just like Tuesday. This time the power went out. That was scary. Around 6pm the snow stopped and we went out to dig in the dark with headlamps on. But seriously, we were no match against the snow. There was 6 feet of the stuff. The snowbanks were taller than us. I climbed on top of the bank and tried to shovel it further away. Eventually we gave up. The sump pump hole in our basement was about to overflow so the guys carried a generator over from across the street. They were just about to go down in the basement to plug it in when the power came back on! We cheered! Today is Friday and I hope this lake effect snow is done. We hired one of our neighbors who has a Bobcat to dig out the end of the driveway. A plow hasn't gone through in awhile, but once it does, there will be more shoveling ahead of us. I'm not sure what my town's official snowfall is, but we are near Hamburg and they recorded 84.5"!!! So I'm sorry I missed you if you tried to find me at the RMSC Holiday Bazaar this weekend... this is what I'm up to instead... up to my ears in snow. Literally.